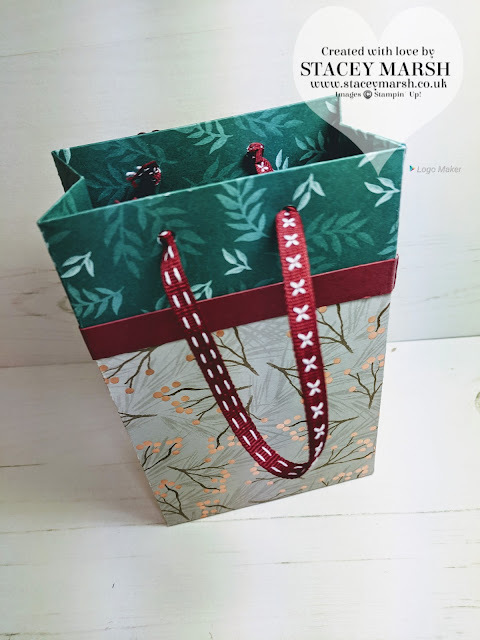 Today I am showing you the final project that I put together for the ladies who attended my Christmas Class this week, and it's a gift bag made from the lovely Joyous Noel DSP. To make this gift bag you will need one sheet of DSP measuring 9.5" x 12". Using your Simply Scored, along the longest line, score at 1", 2", 5.75", 6.75", 7.75" and 11". Turn the DSP around, and score along the shortest length at 1.5" and 7.5". Put the bag together with the top 1.5" edge folded over to reveal the other side of the DSP. Cut a piece of cardstock measuring 0.5" x 11.5", and score at 1", 2", 5.75", 6.75", 7.75" and fold around below the section that you have folded over. Punch two holes using a hold punch to attach the ribbon handles.